Make a Flower Bed in YOUR Landscape that Just Keeps Getting Better each Year. Do you love beautiful flowers? Make a flower bed, or 2, 3, 4, 5, or as many as you want. Read on to find out how. Express your love for flowers and show off your personal style in your landscaping. Make your flower beds grow better with Gardening Essentials from OUR GARDEN SUPPLY STORE! Discover how to make a flower bed like I have featured on this page. Actually this page features several flower beds that are in my landscape. Some of the flower bed on this page were planned, others happened to evolve from other projects. You will see these flower beds in the early stages and then as they have matured as the flowers filled in. All of the flower beds on this page are simple to make. 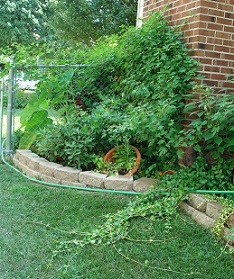 The first photo right- shows the flower bed that was made next to our extended fence. (We brought our fence forward about 20 feet),to make our unused side yard part of our backyard. 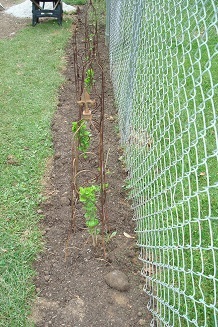 The photo shows the fence line with new Rose of Sharon starter plants newly planted next to the fence. This evolved into a much bigger project. The next photo left shows the way that same area looked a few months later. Originally I removed the sod about 18 inches from the fence line. I don't like straight lines in landscaping. We later decided to remove more sod and create a curved pathway through the entire area. That meant more sod had to be removed. I then had a much larger area in which I looked at as an opportunity to MAKE A FLOWER BED! I get excited just thinking about it! I love flowers, I recently realized that my entire house is completely surrounded in flower gardens. I am fine with that! The photo below left shows a temporary for the pathway. That pathway too, will evolve. The pathway was later covered with kenlite stone and the flower gardens were covered in large river rock. Check out this cool idea for some of YOUR Flower Beds! 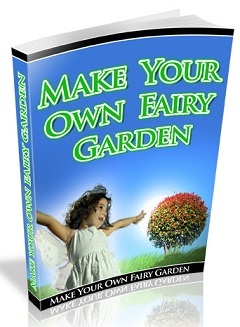 ~"Learn The Art Of Turning An Ordinary Garden Into An Extraordinary Fairy Paradise"Click Here! 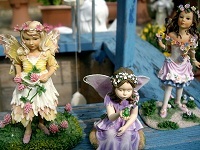 Design beautiful fairy garden spaces that excite & enchant & learn how to make money selling fairy products. Invite garden faeries in & listen for laughter and joy during play. This would be a wonderful garden to encourage partcipation from your children. So get your children or grandchildren involved in your gardening fun! Check out the Natural Stone Patio in our Secret Garden and Find Out How YOU Can Build One too! The next photo (below right) shows the lines that were painted to make the area for the pathway before it was built. More sod was removed to make the path. With a defined pathway going through the area to the side of the raised bed garden we could develop the space into a large area for a variety of flowers. 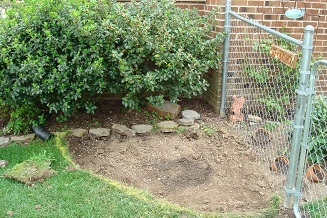 Before I get to far along and get into discussing another flower bed, let me tell you what I did to the first area. The Rose of Sharon bushes along the fence line were young starter plants from other Rose of Sharon Bushes we have in our secret garden and our patio. 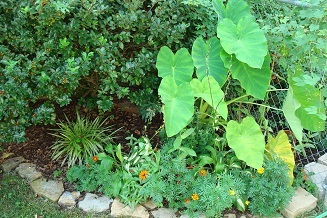 I deliberately planted these starter plants close together to create more backyard privacy. They will become a hedge. The hedge will grow together in a few years and provide a wall of privacy for the area. 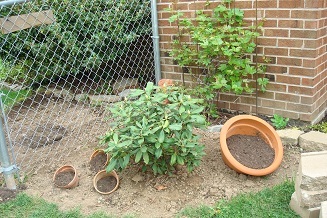 I planted a 3 small azalea bushes in front of the row of Rose of Sharon bushes. I then sprinkled flower seeds that I had saved from annuals, in the remaining area. This year the area is a cottage garden primarily filled with annuals, as you can see in the photo, but next year or later this fall, I will add divisions from perennials that I split. The process of making a flower bed like this is simple. Remove existing sod from the area with a shovel,and plant the type of flowers you want. If the area you want to make a flower bed into is large, rent a sod remover. That is the hardest part of the process. If you want to make a flower bed without spending alot of money use plant divisions or seeds like I did. 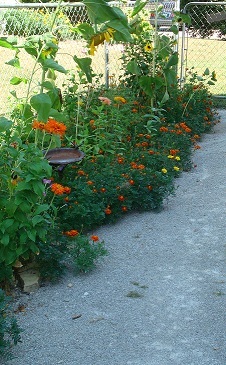 The annual flower I planted in this garden were- sunflowers (not to many) lots of mixed marigold and some giant zinnias. I just sprinkled the seeds on the ground and kept the area watered. The flowers came up quickly. I have large dogs and they are tough on my flower gardens. So I added large stones in the garden to help keep the dogs from digging. I also like the look the stones add to the area. These same stones will later be built into the pathway. Note - do projects like this in stages, to really decide what you want it to turn into. Don't rush and make mistakes in the design of your flower beds or landscaping. I wanted the flower bed to look natural. As you can see it does. The marigolds spill out into the pathway. 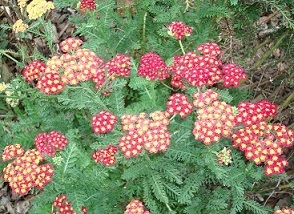 You can get started with your garden with flower seeds from my private garden. Flower seed quantities are limited, so order now! To order seeds from Freda's Favorite Flowers grown in my private Garden go to link below. Make a Flower Bed using Flower Seeds from My Private Garden. Order from Freda's Favorite Flowers Here! Find out more about Cottage Gardens Here As you can see in this photo the curved pathway leads into the main part of the backyard. We added a step from one area to the main yard to make the slight slope seem less obvious. We used alot of fill dirt in this project. We removed a gazebo from the space(see the area with no grass). 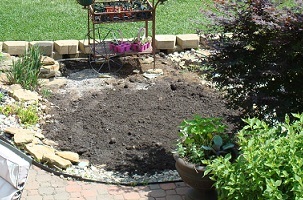 This photo shows a flower bed that is being turned into a day lily garden. This flower bed is in the curved area next to the pathway. It is In front of the raised bed garden. Find out how to Build a Raised Bed Garden here! Again this is a photo of the flower bed as it was being developed. We added transplants of ground cover (sedum) and divisions of 3 types of day lilies in this new flower bed. There is also a purple leafed plum tree planted in the center of the area. My favorite color is purple. The purple foliage from the tree looks great with the green foliage from the flowers mixed together. I have something purple in most of my flower beds. Notice the use of stones and branches in the area. There is also a large stump in the corner of the garden. I use lots of natural elements like that in all of my flower gardens. See how you can use Stones, Tree Branches, and Tree Stumps in your Landscape The next photo shows the front of the raised bed garden. To make a flower bed like this you will need to use wall pavers as the border. I planted 2 elephants ear (annual which I dig up at the end of the season) and marigolds and sunflowers in this flower bed. The step matches the one coming down from the side yard (now back yard). On the other side under the deck there is a flower bed that is also surrounded in wall pavers as the edging. This planter was built first. It is already filled with a fire bush that was transplanted from the original fence line, and sedum that was moved from another part of the backyard. Sometimes it seem we should be called the mobile gardeners. We do move plants around when a project requires it. 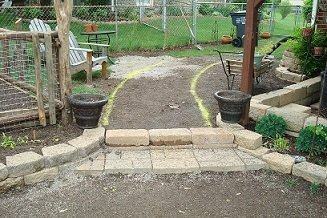 And guess what we did with all of the sod we removed from the side yard - to make the flower garden and pathway! We used the dirt and sod to fill in a pond in our backyard. Ponds require alot of maintenance. So the obvious choice again, was to MAKE A FLOWER BED! in the space the pond had been. In our process of adding on to the back yard we got rid of some items that we were not getting alot of use out of - that included the pond, the gazebo and a never used old hot tub. We gained more usable space in several areas by doing so. We also have less maintenance with these items gone. I have planted the pond garden (as I call it) with annual flowers started from seed for this year. We are determining where are are going to place our firepit (another item that we will be moving)! So for this year the pond garden is planted in annuals but as the plan develops I will be adding perennials to this space also. I will give full details on how the pond became a flower garden too. 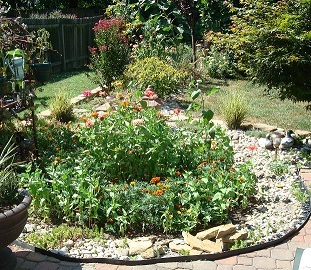 As you can see in a more recent photo the pond garden turned out looking good filled with zinnias, and marigolds. We are planning on joining the patio and the new pergola that supports the swing together by making a pathway where the pond used to be. So next year this area will get a proper finish. See what I am referring to when I mention the new Pergola we built. Get full details here on how to Build a Pergola! And there are even more flower beds to make , because of our fence project! Two other smaller areas presented themselves as opportunities to make a flower bed while the side yard project was underway. The fence was moved forward about 20 feet. See the next two photos above. We placed the front of the fence to begin next to the chimney of the house. We added to smaller flower bed at the entrance of the fence on either side. To continue the landscaping from frontyard to the backyard. Again I added curved lines to break up the straight lins of the house. The flower bed in the front yard was edged in natural stone to match the other landscaping in the front yard. Build Stone Borders around your flower beds, find out how here! The flower bed in the back yard was edged in wall pavers to match an existing planter that had been built a few years ago. I added a few terra cotta pots turned sideways to the planters to add interest. Try this when you make your flower beds, it is something different. Make sure you use unbreakable pots if you leave them out in the winter. I take my terra cotta pots out of the landscape in the winter months to avoid damaging them due to freezing tempuratures. 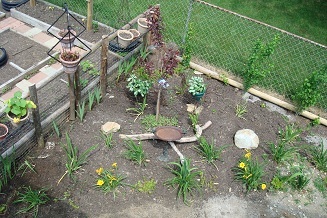 As you can see from the last two photos the flower beds filled in with a variety of perennials and annuals again. All of these thoughts and ideas are meant to inspire you to make a flower bed or 2-3-4-5-6-7-.........for yourself. Once you make a flower bed it is contagious and once you get the bug, it is all over but the planting! As you can see I have it bad, with no hope for a cure anytime soon! All of the flower beds I have shown you on this page will continue to get better year after year as they get filled in with more perennials and less annuals. I use annuals as fillers to enhance perennials in my flower gardens. You can do the same thing and grow beautfiul flower gardens to enjoy for a long time. Have fun with your garden and share your story with us. I will publish it on this website! Do you have a great story about this? Share it! Show off you skills and your green thumb. If you have a great flower bed filled with beautiful flowers that you created yourself, share it with us!